Confidence comes from trying scary things, not just willing it into existence. This last summer, I fell while rock climbing. I was climbing outside when I fell. I was lead climbing, which is a technique where the climber attaches a rope to themselves and clips onto protective carabiners (also known as quickdraws, or referred to colloquially as bolts) on the route, instead of being attached to a rope that’s attached to an anchor. Since I was climbing around a corner and had not yet clipped myself into the third quickdraw, I went swinging around and smashed into the rock. My leg was bleeding profusely and I had to get stitches. A few weeks after the incident, I wanted to get back on the wall and lead climb again. I didn’t realize how shaken up I was until I was trying to get to the second bolt. I started thinking about my previous falling incident and panicked. I was unable to go further and had to be lowered to the ground. I wasn’t ready to get back on the wall yet. Here’s how I returned to the wall, and in turn, went after greater risks in my own job. The indoor climbing gym is a great area to practice climbing, and in my case, practice falling. I certified to lead climb in the gym so I could get more experience in this area. The certification test for lead climbing was pretty simple: climb up and clip into seven bolts along the way, do a couple of extra moves, and then fall. I had a job interview the next day, so I told myself that if I was able to get the certification, then I could do anything — include interview for a position that felt out of my league. My legs and hands were shaking as I climbed up. Even though I trusted my belayer, I still was worried about falling and injuring myself again. I clipped in slowly as I rose up the wall, trying to breathe. I reached the seventh bolt and clipped in the rope. I made a couple of more moves and paused, breathing fast. Then I let go. Since the route was slightly overhanging, I didn’t hit the wall. Instead, I fell about five feet through the air before my partner caught me. I had done everything correctly and received the certification to lead climb in the gym. The next day was my interview. After experiencing the fear of falling through the air, talking with a hiring manager and answering their questions wasn’t as terrifying. I was still intimidated by the prospect, but I did it anyway. Having a fear of falling is completely normal. A lot of the best climbers have to confront that fear at some point. The fear itself isn’t irrational or a sign that you’re crazy. It’s your subconscious trying to protect you. A phantom fear is a fear that presents no actual harm. 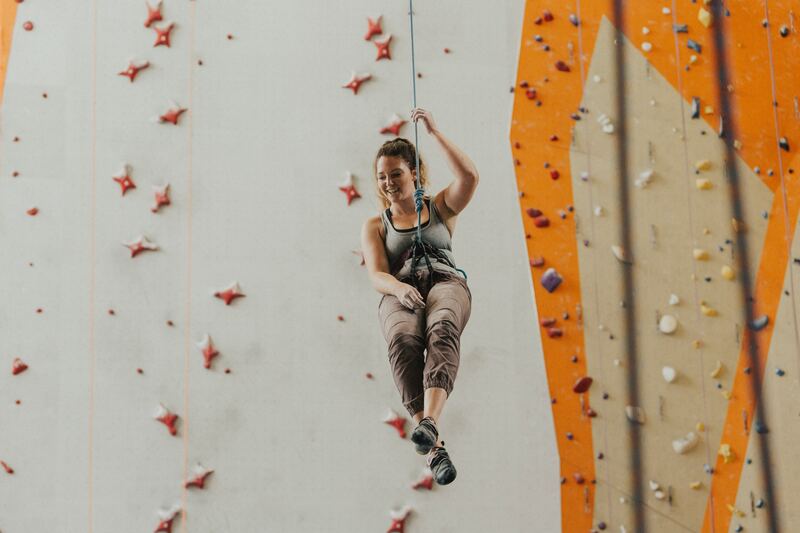 While lead climbing is dangerous, if you’re clipping in along the way, are harnessed and tied into the roper properly, and have a belayer who’s looking out for you, you minimize the danger. Phantom fears exist everywhere, especially when you’re trying to improve yourself. Part of dealing with phantom fears means realizing you’re not actually in danger. I had to remind myself that I was going to be okay, even if I got rejected from this pitch. I’d be fine even if I didn’t get this position. But even though in my head I knew that I would be fine, actually executing it was another challenge. So I had to practice. The best way to confront the fear of falling is to take practice falls, no matter how scared you are. In the gym, I would climb up at least four bolts and then let go of the wall. I did it at least six or seven times to get more used to it. If you have to send an email or contact an intimidating person for business advice and are feeling terrified, remember: you are not actually in danger. Sometimes it just helps to do it anyway, even though it’s crippling in the beginning. Just doing these small test runs can help you gain more confidence. I didn’t get that position I interviewed for. However, during that time I was waiting to hear back, I tried to do what I could to make my current position even better. I started looking for needs within my workplace and filling them. I told my boss about the job interview and he was supportive, but was also open to finding ways to give me more responsibility. I gained more responsibilities and found more ways to make my job meaningful. I gained more confidence in my abilities not from willing the confidence into existence, but from trying scary things. I had to talk to people about giving me more opportunities while also presenting my own solutions to them to see if they’d accept it. Not everyone gets to have a boss who would support them looking for other jobs. I’ve gotten more opportunities, even if they haven’t happened the way I originally aimed for. Overcoming fear never really rids you of that feeling of butterflies and fear that something might go wrong. A hobby like climbing puts other challenges in perspective. It could be worse. After all, you could be rocketing toward a hard rock wall. Trying hard things gave me more confidence, even when it hasn’t worked out. The victory here is in the trying, not in the achieving.